This morning I was bitten by a bug. I was having my morning tea , and one of those "I don't like how this vase on my fireplace looks like, I need to do something there" bug. And guess what? Twelve hours later the whole room is transformed: I painted the wall above the fireplace; I re-arranged two closets and freed up a small bookshelf to go in the living room as a space divider and to serve as a shelf for my photo props. The place looks crisp and fresh, and now I need to decorate it as the vase that started it all is just a lone standing figure above the renovated fireplace. While working in the closet I re-organised my clothes by sleeves (sleeveless, short, and long); I got rid of any clothes I have not used in a year; I did laundry; and I am ready for some rest. 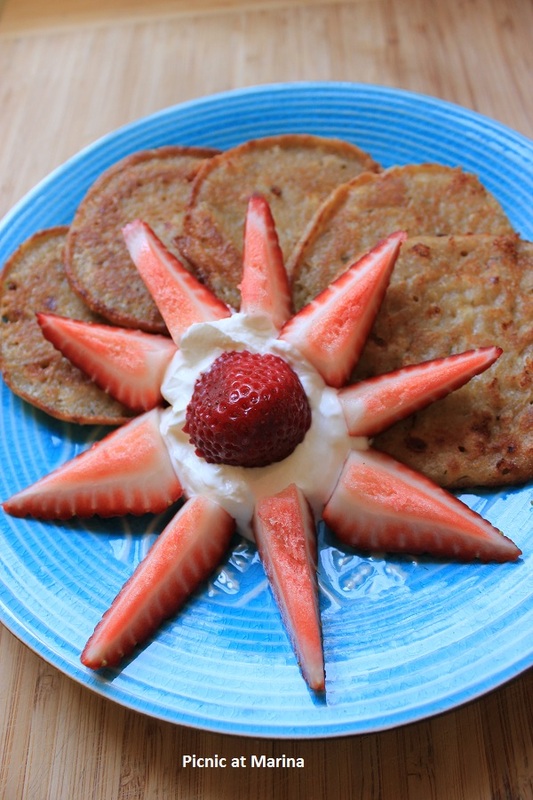 So what all of this has to do with the oat pancakes? And why it's accidental? Well, at first it was suppose to be a bread, a rye bread. Last night I mixed all the ingredients, put the dough to rise, clean the kitchen counter and took the flour bag to put it in it's place just to realize that I used an oat flour instead! It wasn't in my plans to make an oat bread and I added some water to the dough to thin it out and make a batter to use in the morning. In the morning, before the cleaning-painting-organizing bug bit me, I made a great pancakes. To the batter that I already had from the last night, I added an egg, two cups cottage cheese and some sugar. Then spooned it into a frying pan, cooked it on both sides until golden brown. I served it with a sour cream and strawberries. I know sour cream sound strange for many of you, so just use whipped cream, maple syrup, honey, or whatever you like with your regular pancakes. Those pancakes were good, and gave me energy to run all day to do my "little" project - the vase project. one small thing spontaneously leads to a big all day project? What a beautiful presentation! 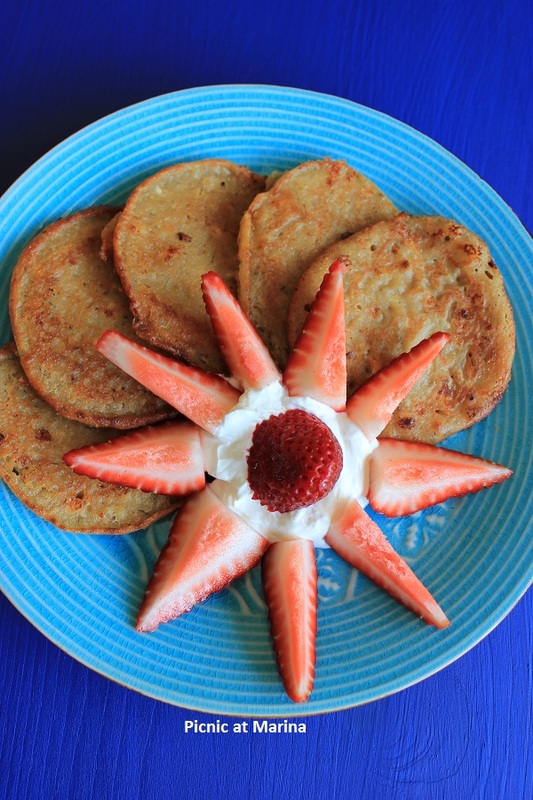 Those pancakes and strawberries look decadent. Yes, one little project often leads to an all day project. a beautiful presentation. Delicious pancakes! This king of day, I really like... when you accomplish EVERYTHING! Like your pancakes! i can imagine that the place look beautiful! Your pancakes look fantastic, what a beautiful presentation! Love it!!! These are great looking pancakes. I like the story of you came to make these pancakes. Sounds like you were busy. I love accidents like that! I actually had a day like that today! This morning I walked into a room that was disorganized, and just bugging me - and now it is all organized and it makes me smile just to walk in there! How delicious can these get!